GUACAMALLAS anti bird netting is a synthetic mesh that is laid over crops, fruit trees to prevent frugivore birds like sparrows or blackbirds to damage the commercial value of any fruits or grains, either in the fields of already harvested and in the warehouse or packaging plant ready to be shipped. 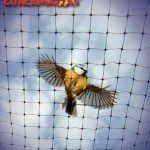 Bird netting is also very useful to control pigeons and acts as a really effective bird barrier in balconies, terraces and roofs in urban environments. See her the pictures of GUACAMALLAS bird control netting in actual use!